Big in Japan! ...Or not. : I get to use my blogs 'work' tag again! So, yesterday David and I went for a small ice cream date. 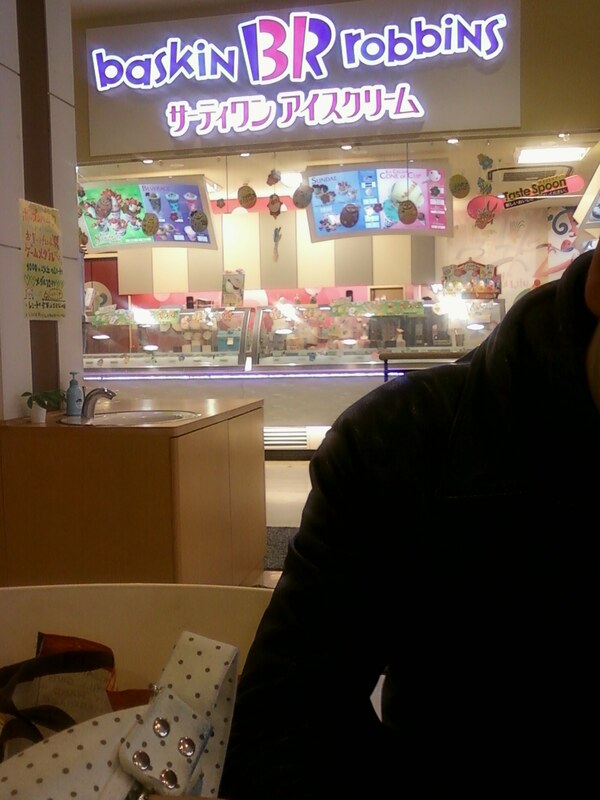 There's a Baskin Robbins in the grocery store food court across from us. So, we bought some groceries and stopped for a quick ice cream pick me up. 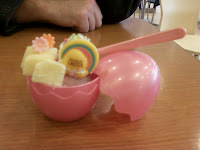 I got the Easter themed sundae~ It was really cute! And it tasted good, too! Pieces of shortcake, whipped cream and sprinkles on top of chocolate mint ice cream. But, the ice cream was pink and blue in colour with pink, white and blue chocolate stars. Sooo cute and sooo good! I'll definitely get that flavour again, if it's not seasonal! After my interview today, I hopped back onto the subway headed towards Sendai station. I grabbed a quick caramel macchiato and headed for my train to head home. The trains, as I mentioned in my past post, have been decorated for the season. They look so pink and pretty on the outside! I took a few photos of today's model, and I apologize for the blurriness! I was bursting with glee at that point, so my hands might have been slightly shaky.